Fly Eagles Fly. It's everywhere. Fans are asking "If not now, Wentz?" It's a good thing Teddy Bridgewater went out with an injury because right now, Bradford might be the Eagles quarterback. I'm no Eagles fan. I've been suffering in relative silence since 1985. Okay, that's not true. My hometown franchise, the Chicago Bears have hung their hats on our Superbowl team for a long time, probably too long. My only saving grace living in Philadelphia is that Eagles fans have been waiting longer. As a transplant from another state, I never adopted another team based on where I live. There is a relative discomfort when I go into any store and am visually attacked by the sea of forest green and have to endure the Fly Eagles Fly mantra everywhere including the grocery store where I might see a life size cutout of Carson Wentz trying to sell me some Pepsi for the upcoming game. When I moved here five years ago, I wasn't sure what to expect. Philly fans had a certain reputation about them. Still, I proudly flew my Bears flag on every Sunday despite the questions and the gentle (boy was I surprised) ribbing from neighbors. The first time the Bears and Eagles met, I made a bet with my neighbor for $1 that we'd come out on top. I found a dollar bill under my windshield wiper the next morning. This season though only in week three has already been deemed a lost year for the Bears. Cutler is hurt though most of Chicago is not concerned. It would be nice to have a quarterback you can trust. Jay Cutler isn't that guy. Though he hails from Santa Claus, Indiana whatever carryover magic he once had is long gone. The Bears failed to resign Matt Forte who is flourishing in New York, of course and our receiving corp while centered around Alshon Jeffrey is missing the one two punch that we had with Brandon Marshall. It's time to rebuild for us. Cutler is the oldest player on the roster at 33 and has no one on the team with him since cutting Robbie Gould, that played on the NFC North Division Champion team that went 11-5 under Lovie Smith. As bad as the Eagles have been in past years under the help of Chip Kelly whose coaching style was attack, attack, attack, at least this year they have decided to roll the dice on Wentz who through two games, though against two weak defensive teams including my beloved Bears who looked more like the Bad News Bears, has shown poise in the pocket and is making things happen on the field. What a difference a good quarterback can make for your team. I've been watching football this season on Verizon with my son, who is now part of a Dads and Kids Fantasy Football League that I started. It's a great way to bond together as he learns more about the game and maybe he'll understand why daddy is always yelling at the television now. The Eagles look pretty good this season and it's not just about Wentz though Jon Gruden may want you to think otherwise. If he didn't ask Carson Wentz to the prom after Monday Night Football, I would be shocked. A team win means that all aspects of the game are managed including offense, defense, and special teams and the Eagles have done that. The Bears' new kicker missed a field goal, the Philly defense kept them out of the end-zone. Sacks and interceptions on defense lead to opportunities on offense. The Bears only scored in garbage time when none of that mattered. This Sunday becomes the true test for Wentz. After facing the 19th ranked Browns defense and 16th ranked Bears defense, he will face the interstate Pennsylvania showdown with the Pittsburgh Steelers. Neither the Browns or the Bears had any sort of pressure on Wentz in either game and it showed. 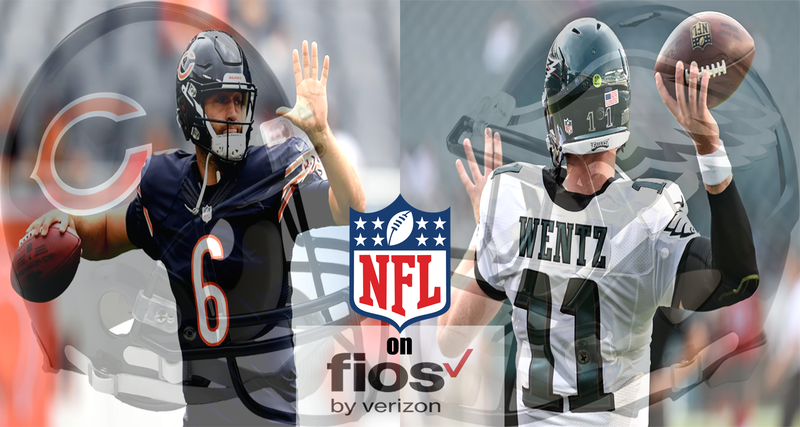 You bet I'll be watching this Sunday on Verizon FiOS to see if the mantra Fly Eagles Fly really does stick.